Everybody’s trying really hard not to call it the end of an era. 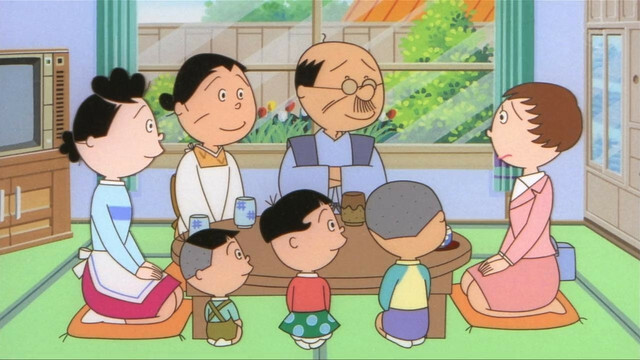 But after 48 years the Toshiba Corporation is no longer the chief sponsor of the Sazae-san cartoon. Based on Machiko Hasegawa’s mild-mannered comic series, which itself ran from 1946 to 1974, Sazae-san has always been a time-capsule of post-war Japan. Its leading characters, a family with three children and several relatives, led by the titular harassed housewife, were always intended to be timeless. Scriptwriter Masaki Tsuji once explained that the stories were supposed to be as taboo-free as possible, sure to catch the largest possible viewership on primetime. But they were also decreed to be free of bad language, modern slang and electronic devices. Sazae-san lives in a Japan untroubled by right-wing nationalism or looney religious cults, where nobody has heard of Tinder or Facebook. She has become a living fossil – even her three-child family is an outmoded phenomenon in a Japan where few can afford more than one kid. If you haven’t heard of her, then you can blame her late creator, whose contracts, signed before most of you were born, stipulated no spin-offs, which has been interpreted as meaning a ban on videos and DVDs. That hasn’t stopped Sazae-san being the top-rated cartoon on Japanese television, and the longest-running cartoon series in the world. And all through her broadcasting history, Toshiba has paid the big bucks to top and tail every episode with whatever is up to the minute in electronics – air conditioners, washing machines, faxes and laptops. For the first thirty years, Toshiba was the sole sponsor, and even sneaked some of its devices into the show itself in early product placements. But now that all has to change. Stumbling in the American atomic energy market and reeling from a series of accounting scandals, Toshiba can’t afford to keep fronting the cash. Instead, it gave the producers a season’s head start to find new sponsors, and officially bows out this March. Is this the end for Sazae-san? Fortunately not – although nobody has the clout to be the sole sponsor of a primetime anime, someone did rustle up a committee of new sponsors to carry the costs. Clearly seeing the viewership as a bunch of young home-makers, the baby-wares company Nishimatsu has stepped up, alongside Daiwa House, a residential builder. Another new funder is Amazon Japan, suggesting that perhaps Sazae-san might soon be under pressure to allow a particular kind of new spin-off after all. Could streaming episodes be in its future…? Jonathan Clements is the author of Anime: A History. This article first appeared in NEO #174, 2018.